This Sheet Pan Lemon Garlic Roasted Chicken and Potatoes is incredibly simple, but seriously scrumptious! The chicken and potatoes are bathed in plenty of herbs and a delicious bright citrus sauce that will make your taste buds dance. The perfect answer to hectic weeknights. Whole 30 friendly. Preheat oven to 425° F. Line a 15x10 inch baking pan with foil; coat foil with cooking spray. In a small bowl, combine olive oil, lemon juice, lemon zest, salt, pepper, oregano, rosemary, garlic powder, garlic cloves, and red pepper flakes, if using. 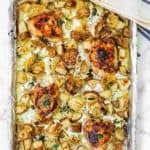 Arrange potatoes and chicken on the prepared baking sheet. Drizzle oil mixture over the chicken and potatoes; mix to coat. Place lemon slices and onion around the chicken, if using. Roast for 35- 40 minutes, or until a thermometer inserted in chicken reads 165°, and potatoes are tender. Garnish with fresh oregano, if using. Serve hot. TIP: Sometimes I double the quantities of the sauce ingredients just to have enough sauce to drown the potatoes and chicken in it. This time I used skin-on, bone-in, trimmed of excess fat thighs but of course, you can use chicken breasts or legs if you prefer. Depending on the size of your pieces, you probably will need to adjust the cooking time. A meat or instant-read thermometer is your best bet for determining the doneness of your chicken. 165º Fahrenheit is the safe internal temperature for both the white meat and dark meat.